In the name of God who is Father, Son and Holy Spirit, Amen. 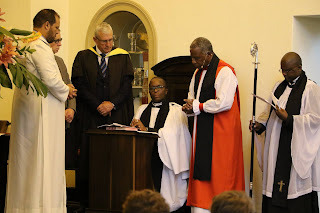 Dear brothers and sisters in Christ, dear people of God, Mr (Guy) Pearson, heads of departments, educators, friends and families, it is a great joy to be with you today and share in this milestone in the history of Diocesan College. I always refer to this College as my second home from Bishopscourt. It was in this chapel that in September 2007 I was elected the Archbishop of Cape Town. Entering this chapel always bring those memories when the church asked me at take this responsibility at a young age. A warm welcome to you all – and thank you for inviting me. Also, thank you to all the chaplains who are here for your supportive presence. A special welcome to Fr Monwabisi Peter, to your dear wife, Nolubabalo, and to Ongamela and Onathi. 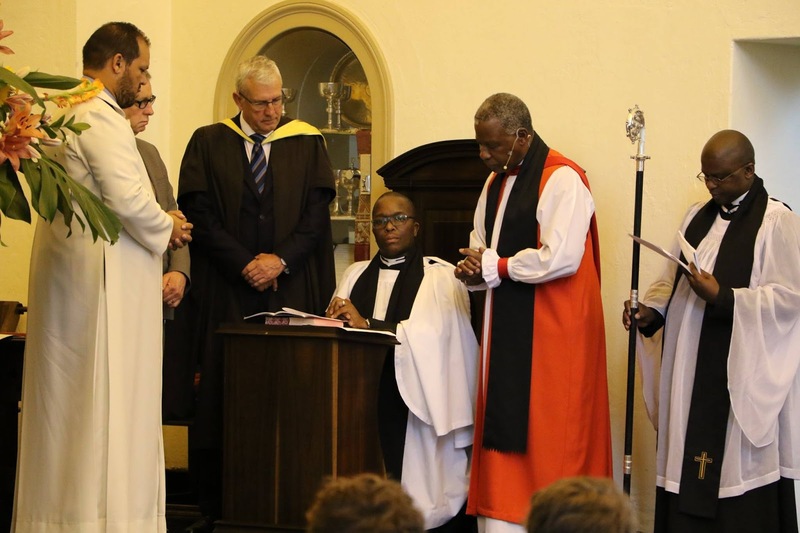 Welcome to the Diocese of Cape Town and to Bishops. Today, we commemorate the Confession of St Peter in the Anglican calendar. According to today’s Gospel reading for the Eucharist, Matthew, Jesus and his disciples were at Caesarea Philippi (Matt.16:13ff). This city was rebuilt by Phillip, Herod’s son and was to the north of the Sea of Galilee, near the slopes of Mount Hermon. Originally it was called Paneas in honour of the Greek god Pan, whose shrine was located there and the region was mainly pagan. It was there that Jesus asked his disciples: “Who do people say the Son of Man is?” and it was God’s work that Peter was able to recognise Jesus as the Messiah. Jesus in turn affirmed that Peter would have the keys of the kingdom of heaven, and would be the rock on which Jesus would build his spiritual house. Peter would become the major steward of the future Kingdom to be set up on earth. He would bind or set loose, he would forbid or permit; only what he would decide would be rectified in heaven. What a task to set upon the shoulders of one man! If the same question was asked of us today, what would be our response? What is Fr Monwabisi being called to do, what are all of us, teachers and boys, called to do in the here and now? Would we, like Peter, respond to God's call? In your Vision Statement, Bishops is committed to a value-driven education and strives to embrace and celebrate the diversity in the communities of the school and nation. How best can these be applied to our society? How, using Peter’s Confession, the Gospel reading we heard today, and the values the school promotes, can we help and enable others to build a society which confesses the Prince of Peace? In my Christmas sermon, as has been referred to by Guy in his welcoming remarks this morning, I raised as a major concern for our country the high levels of aggression we see in many areas of our society. I said that it is crucial, and necessary, to eradicate corruption and improve the efficiency of government, but it is not sufficient on its own to ensure better lives for our people. I addressed in particular the violence among young people in some of our public schools, the violence taught to the young by adults, on picket lines strikes, and violence in politics. If we were able to export the values of tolerance and respect for diversity for which Bishops stands, and to spread it through society, South Africa could be transformed. We would not, for example, be seeing the violence and total disregard of the people of Xolobeni we are currently seeing in the Eastern Cape, where the mining authorities seem hell-bent on ignoring the wishes of the local community by allowing an Australian mining company to exploit their resources and destroy that beautiful cost. I will be writing a note to my colleague, Archbishop Philip Freier of Melbourne, asking the church to intercede with his government. Please join me in support of this community and encourage the initiative for courageous conversations in the mining industry which I am engaged in. You also aspire in the school's Vision Statement to address global issues. If South Africa could export the values of tolerance, the settlement of disputes by negotiation and a willingness to pursue the common good, we could help counter the distressing tendency of people elsewhere – for example, those in Kenya, Somalia and Zimbabwe – to opt for violence and aggression, whether it is to suppress opposition or to protest over injustices. We learned in the Gospel passage that was read today that God reveals himself to us and at the same time hides far more than he manifests. God reveals himself to those who are as spiritually dependent on him as babes; and to those whom the Son chooses to reveal Him. Sisters and brothers, Christian revelation addresses itself to our hearts, to a love of truth and goodness, to our fear of sinning and our desire to gain God’s favour. We are all accountable to Christ as our judge and so all must seek his favour and have him as our Friend. When we believe in him, we shall be justified by him – Christ, our Righteousness. The forgiveness of sins lays a foundation for all other favours and blessings and so if sin is pardoned, all is well and shall end well. Fr Monwabisi, as you take up this new ministry, you are called to reach out to those who have transgressed and to call them back to God. You have to keep your spiritual integrity intact, resisting becoming like those who resist God. You are called to reach out to everyone, whether or not they accept God’s message. That is the essence of your call to this ministry and institution. I invite you all, with Monwabisi as your Chaplain, to transform the society and the church, this school, this city and the world. God loves you, and so do I. Congratulations and we wish you well.